Jason Barr, an English instructor at Blue Ridge Community College, wore a “Run DLK” t-shirt to breakfast at a Virginia Community College System Chancellor’s Developmental Education Institute event. The shirt put a hip hop, Run DMC twist on Dr. Who’s arch enemy the cyborg Dalek race--an inside joke for ardent fans of the longest-running science fiction show on television. The pair hit it off and began exchanging messages via email and Facebook about a possible project related to "Dr. Who." They pitched the idea for a book to Scarecrow Press in Maryland and it was accepted. The result is Barr and Mustachio's new book, “The Language of Dr. Who: From Shakespeare to Alien Tongues,” on sale now at Amazon.com. Every incarnation of Dr. Who’s 11 “regenerations” and all 50 years of the show are covered. The book targets an audience of science fiction scholars and serious fans of the show seeking new perspectives. The book deals with the shows use of fairy tales, myths, nursery rhymes and Shakespeare, among other things. “Contributors consider how the Doctor’s companions speak with him through graffiti, how the Doctor himself uses postmodern linguistics to communicate with alien species, and how language both unites and divides fans of classic ‘Who’ and new ‘Who’ as they try to converse with each other,” according to the description. Why does "Dr. Who," a story about the powerful lone survivor of an advanced civilization traveling the universe, have such staying power? “It’s a fun story of adventure,” Mustachio said, ushering “the audience through space and time,” that’s capable of bridging the gap between generations. “My kids and I have favorite episodes,” she said, adding that she and her husband have their own favorite episodes dating back to when they were children. 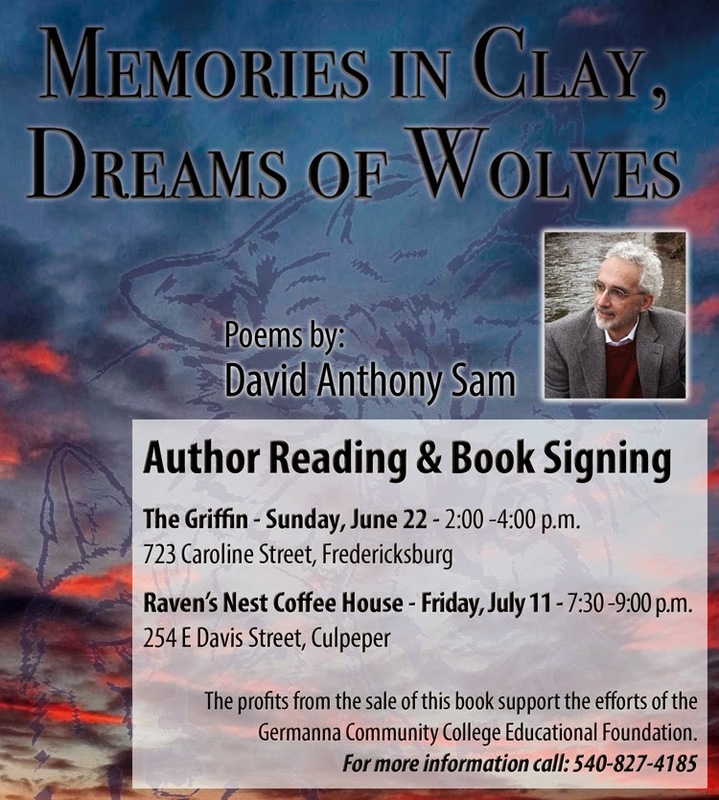 Sales of Germanna Community College President David A. Sam's new semi-autobiographical book of poetry, “Memories in Clay, Dreams of Wolves," go to the GCC Educational Foundation. The book officially launches this Sunday, June 15. It's on prelease sale now on Amazon.com. It’s Dr. Sam's first full-length collection of poetry. He has readings and signings set for 2 p.m. next Sunday, June 22 at The Griffin Bookstore and Coffee Bar in downtown Fredericksburg and for 7:30 p.m. Friday, July 11 at The Raven's Nest Coffee House in downtown Culpeper. Congratulations to Germanna student Charnee Long, who has won online voting for a modeling contest and will appear in a national ad for Ambi, a skin care product. She's a general studies major planning to complete her last course this summer and transfer to George Mason University to major in early childhood education with a minor in communications. During a roundtable discussion about college affordability at Germanna Community College this week, Sen. Tim Kaine praised the way Virginia’s Community Colleges in general—and GCC in particular—tailor workforce training to meet needs in their service regions. Sen. Tim Kaine watches an unmanned aerial vehicle built by Germanna engineering students take off during a visit to the college this week. The UAV design won a recent Philadelphia competition for the GCC student team, besting Drexel, Yale and more than a dozen other universities. The CEO offering is part of SkillUpVA, a Germanna Center for Workforce and Community Education program that provides individuals with the skills to make the most of career opportunities in an economic environment shaped by rapid technological change and increasing global competition. He noted that each community college works to address business climate needs unique to its region.